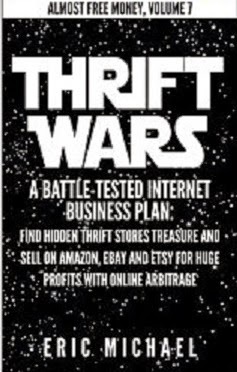 Thrift Wars is the first book to provide instruction on all aspects of building a successful online home business selling books, vintage collectibles and selling used clothes and other products on multiple internet platforms from the comfort of your own home. Complete primers on internet selling and retail arbitrage can cost up to $200. After all, why would a successful thrift shop reseller tell competitors instructions how to build profitable shop in their own niches for cheap? They wouldn't, right? Well, I have been a successful seller on Amazon, eBay and Etsy for years, but I have recently transitioned to providing help for aspiring online business owners, so I have no reservations about telling you exactly how to find the most profitable sales items at second hand stores and sell them online for high profit margins - for less than the cost of a cup of coffee. As soon as you sell one additional inventory item, this book pays for itself! The first complete guide to reselling thrift store items using internet arbitrage - illustrated with actual thrift shop treasure found hidden on the shelves of Goodwill and Salvation Army and the prices the items were sold for online. Learn how to process a thrift shop like a professional and locate the most profitable resale items. Learn how to determine which online platfrom you should sell your items on for maximum profit. Learn how to diversify your online sales across multiple internet sites by learning how to sell on Amazon, in addition to selling on eBay and Etsy. 90% of your competition sells on only one platform. Blow them out of the water by using the unique benefits each platform provides to the thrift store flipper. Learn how to sell something on Amazon, including instructions on how to sell textbooks to Amazon. Learn the pros and cons of selling used books, media, CDs and video games on Amazon FBA. Tips for eBay buying and selling, including selling used clothes and vintage clothing on eBay. Swipe precious metal treasure like gold jewelry and sterling silver items from right under the noses of your competition. Learn how to build a great Etsy shop for selling vintage and retro items - includes Etsy SEO and Social Media for Etsy. You've heard the stories of people that sell $2,000-10,000 a month worth of goods found at second hand stores. Many of these stories are true! With a little bit of research (reading Thrift Wars is an excellent start) and some hard work, you too could easily expect to earn comparable monthly revenues. Don't wait for your competitors to catch up. For more information on Almost Free Money books and hundreds of free internet selling blog posts, visit http://www.ericmichaelbooks.com.